Rollerblading has seen a comeback in recent years. The beloved sport of the 1990s has returned with more popularity, and now is the best time to grab a new pair of skates. There are many brands, styles and models on the market today that each cater to different types of users. With the right research you can find the perfect pair of rollerblades. Use the list below as a starting point. In no time you will be skating along having the time of your life. Rollerblade is known as a maker of great inline skates at affordable prices. They offer everything from professional grade skates to ones made for the casual hobbyist. Since 1982 they have pushed the hobby and sport to new heights due to their commitment to quality, style and innovations. The Macroblade 90 is an exceptional pair of skates that make a perfect set of starter skates or an addition to your inline skate collection. The first feature that you will notice is the color scheme. These have a cool black shell with grey and seafoam green highlights. The wheels are white with the black, grey and green accentuating them. There is a solid black rubber wheel brake pad that can be removed once you are comfortable. This feature is great for the beginner as he or she advances in skill. The wheels themselves are 90 mm. This is a perfect size for either indoor or outdoor skating. The diameter is considered to be a standard for recreational use. Smaller wheels tend to favor aggressive skating, artistic inline and roller hockey. 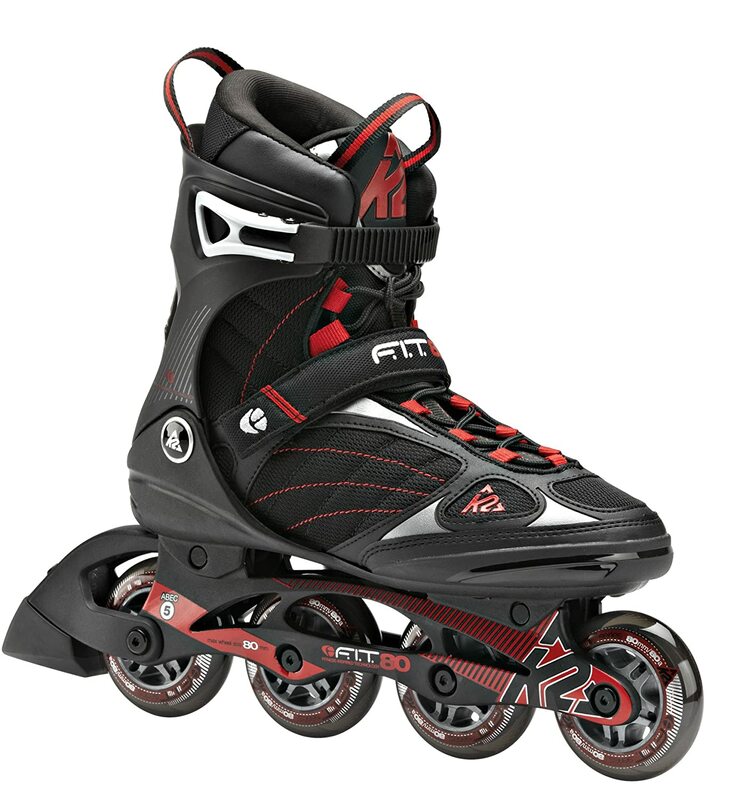 The larger sizes are favorable for all purposes while 100 mm and up is better for speed skating. 90 mm will suit a wide variety of uses. You will get the most out of these skates no matter your style. These skates are made for high-performance. The frame is a solid 280 mm aluminum cast frame that maximizes speed, agility and ease of use. The aluminum buckle keeps them secured while you ride. The Velcro strap makes sure that your feet are kept tightly locked in. This ensures minimal foot movement inside of the skates. The lacing system is built for extra security and a snug fit. Expect to feel secure, safe and comfortable in these rollerblades. The Form Fit inner lining is made for comfort. It will fit a wide range of feet shapes. You can skate for hours due to the ergonomic design. The training footbed is ideal for endurance riding as well as leisurely strolls. Your feet will thank you for thinking about them! Users love the color scheme of these rollerblades as well as the overall comfort that comes with wearing them. Many customers report a lack of blistering from long skates, smooth control over sidewalk surfaces and a durable feel to the shell. There are very few reported downsides to owning these skates except perhaps the natural desire to want more than one pair because of how great these skates are. You can find these from $177.78 to $199.99. This price is competitive in comparison to other similar models. They will definitely not break your bank. You will get your money’s worth and more with the Macroblade 90. Whether you are searching for a great beginner pair of skates or a pair for hard riding the Macroblade 90 by Rollerblade is the way to go. Rollerblade offers you a comfortable, affordable, stylish and durable pair of inline skates that are sure to turn heads. Cruise with ease down the sidewalk or up the vert ramp. No matter your riding style you are bound to enjoy this pair. 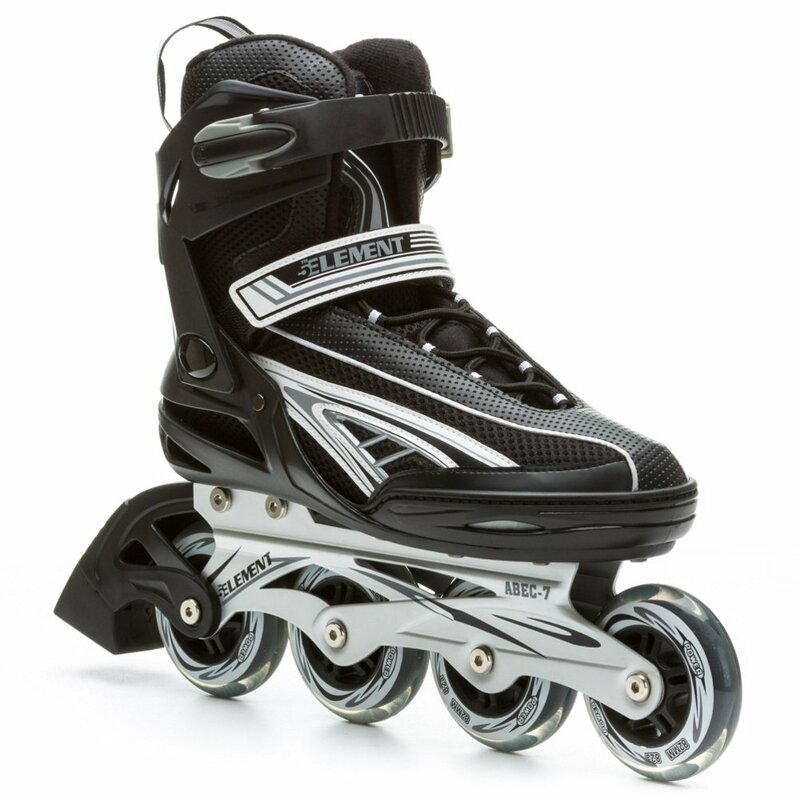 Rollerblade offers a wide range of quality products. 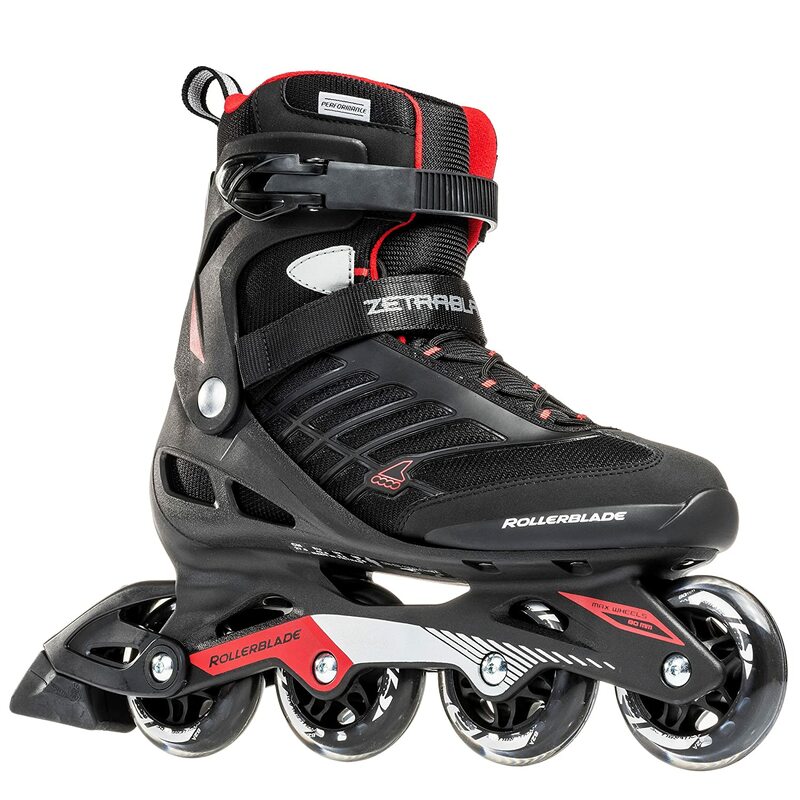 The Zetrablade 80, much like the Macroblade 90, is an excellent pair of rollerblades that puts most others to shame – especially for the price. This pair of inline skates is a great entry model for users of all ages. It mixes comfort and durability with a sleek style that is sure to impress. 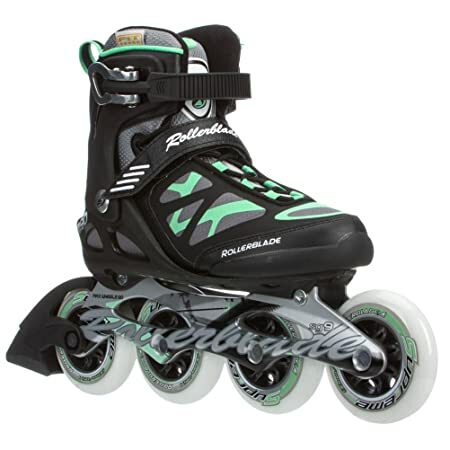 Beginners to inline skating will find that the Zetrablade 80 feels comfortable enough to use for considerable periods of time. This is due to the support offered. There is a solid plastic buckle as well as a high quality Velcro strap. Each provides your foot with the stability that is to be expected from a professional-level pair of skates. The laces add a layer of strength to the fit and keep your feet from moving around. All in all the Zetrablades will make sure that your feet stay safe. The color scheme is black with orange and grey accents. Never worry about style because these will deliver. You will have all of the other skaters, your friends and your family turning their heads as you cruise by. The 80 mm wheels use the same three colors in its design, staying true to the overall look. The wheels are made for all around use. Due to the smaller 80 mm size you can use this pair of skates on a variety of surfaces without sacrificing speed, mobility and comfort. Other customers have said that these wheels tend to last a long time. That is almost vital when shopping for new rollerblades because you do not want to be spending too much time changing out parts. The longer the wheels last the longer you can enjoy the fun that comes with skating. Also included are SG5 bearings inside of the wheels. SG5 bearings will ensure maximum speed and smooth rotation. You will see plenty of use before they give out. Being that Rollerblade was the first brand to take the sport of inline skating to the mainstream you will become a part of a tradition the minute that you put these skates on. Millions of skaters have gone with this brand because Rollerblade knows what it is doing when it designs skates. With the Zetrablade 80 under your feet your skating will be exciting every time that you head out the door. Users say that the look is fantastic. Others have praised the types of skating that these skates allow. This is because of the build quality and overall durability. Whether you are an inline skater, a street skater or a soul skater is not important. The Zetrablades will make it happen. Since K2 Skate opened their doors in 1962 they have been producing fine skating products. With the surge in popularity that rollerblading saw in the 1980s and 1990s K2 shifted to focus on competing with the big names in that realm. They have been consistent in their dedication to excellence. Each of their skates has something to offer every level of skater. The F.I.T. 80 inline skates are no exception and make a great pair to own. First impressions of these skates are great. The slick black and red plays off of each other to create a sophisticated yet fun look. The wheels compliment that design and are themselves black with red accentuating it. These will bring a new flair to your skate style. The black rubber brakes are a solid addition that ensures safety to those not yet comfortable stopping without them. They add a nice design as well. The laces work in a crisscross fashion to provide stability to your feet. The aluminum locking buckle on the ankle adds to the fit and ensures a snug ride. Velcro straps cross over the laces. This puts another dimension of comfort and safety into the mix. The frame itself is a Tec Composite Frame that does a great job in absorbing the impact of different surfaces. That feature makes the F.I.T. 80 an amazing pair to ride over all sorts of terrain. The wheels are 80 mm. This size is great for all-around riding. You can hit high speeds on a vert ramp while also safely cruising down the road. Users report that the wheels and bearings are high quality. They are built to last. Expect to get a fair amount of use out of these skates before needing to change some of the hardware. Customers of all ages have had nothing but praise for the quality of these skates. That is especially true for the beginner. The comfortable design and quality wheels make these one of the best introduction pair of inline skates on the market. They are priced at around $85 for the smaller sizes up to $150 for the larger sizes. This is a broad price range but still under $200 which makes these inline skates quite affordable. People of all ages would benefit from this pair of skates. They are an excellent set that will go a long way in your journey into the world of rollerblading. Give them a shot if you are not looking to spend too much money but want a nice pair of rollerblades. K2 delivers on all promises. Safety, security and fun will be found in this pair. If you are on a budget there is no reason that you cannot enjoy a great pair of rollerblades. If anything you are in luck because there are plenty of budget options that do not sacrifice quality or style. 5th Element has a few models that are affordable yet high quality. Their Panther XT skates are ideal if you want to save a few bucks while also enjoying an awesome pair of inline skates. The look of these skates is minimal and modern with a call back to classic inline styles. The color scheme is a nice black and white that plays off of each other to create a great design. The 82 mm wheels are silver and see-thru with white on the inner circle. Remove the brake pad and you have yourself a pair of inline skates that screams “professional”. The lacing is traditional and will provide adequate support to all sizes of feet. The Velcro strap has the 5th Element name on it and secures the laces. A heavy-duty buckle keeps the ankle protected so that you can enjoy different styles of skating with ease. The chassis is a lightweight aluminum. The 82 mm wheels are perfect for all types of skating styles. The ABEC 7 bearings will perform in a flawless manner. They are quick, smooth and can operate on many different surfaces without a problem. It does not matter if you skate at a skatepark or on the sidewalk. These wheels and bearings will perform above expectations – especially for the price. You can grab this pair of rollerblades for just $69.99. That is a bargain that you will have a hard time finding elsewhere. These are quality skates that customers rave about. They look amazing and perform well. If you are interested do some research on them and give them a shot. Your bank will not be busted, and you will have a fine pair of inline skates. It is easy to spend hundreds – if not thousands – of dollars on a new pair of rollerblades. There are so many different styles on the market that it can be tough to make a decision. Your decision does not have to drain your bank account, however. If you are just beginning out in the sport of inline skating and you plan to stay at a hobby level then you should keep your eyes open for skates that range in price from $80 to $250. Anything above that will be a bit more top end, which is not a bad thing, but it might be too much if you end up hating the sport! A pair of inline skates for less than about $60 is probably not worth grabbing unless you only wish to skate a few times in them before needing to replace something. While good skates can be found at an affordable price remember that you will get back what you put into it. The absolute last thing that you want to happen as an inline skater is to experience a hardware failure while rollerblading. This can be disastrous in the worst case and almost painful in the best. Read what other reviewers have to say before you go with a pair of skates. Make sure that you see them mention the build, design and stability of the skates. It is better to have a good pair that will last than one that will go out on you but perhaps saved you some money. Keep your safety in mind as the first priority. A big part of inline skating for those who are deep into it is customization. Customizing your skates can give you a sense of freedom and individuality. Most skates come with a cool design to them already. However, if you wish you can change out the wheels to add different color schemes to your pair. Other people enjoy putting unique stickers on their skates. If that is something that you want then make sure that the skates have ample space on the sides for stickers and other custom images. Sometimes adding different color laces can put some flair on your skates. Be sure that your pair makes it easy to remove and change out the laces without having to remove the buckle and Velcro strap! Blisters are common in the sport of skating. Rollerblading can be hard on your feet. It is wise to look for a pair that places comfort in high priority. See what the inner dimensions are in the skates you are looking at. If it seems too small it will be. Give yourself enough room in the boot to not feel smashed. You of course need to feel secure but that should not come at the cost of constant blisters. Depending on what you plan to do with your skates will play a part in how well your feet feel in them. If you want to rollerblade to and from work it might be a good idea to go with a very comfortable pair. Maybe you only want to skate around your driveway. That is perfectly fine, but you may not be in them long enough to require extra support. That is entirely up to you, though, and be sure to go with what you feel is best. Some users have inserted different soles into the skates. That is an option. A well-made pair of skates will not need new soles right off the bat, though. Keep on the lookout for ergonomic designs. Your feet are a vital part of your body and any discomfort in them will be amplified due to how much you rely on them! Treat them well. Wheel size is important when choosing new rollerblades. A good rule of thumb is that smaller wheels are made for inline and vert skating while larger diameter wheels are best suited for speed skating. Choosing a wheel size that is somewhere in the 80 mm to 100 mm range will give you a great all-around wheel that can be used in most applications. Check out the different sizes and what other skaters have to say about how they perform. Inline skating is a great sport. The hobby has grown over the past few decades to include some exciting new products. Beginning the hobby is not expensive nor limiting in who can do it. People of all ages can enjoy rollerblading. If you have questions or concerns perhaps speak with your doctor before you buy a pair of skates. The exciting thing is that rollerblading is versatile. There are types of skates to fit every type of person. With enough research you will soon enough be cruising down the road in a new pair of rollerblades.